Idli is a fermented carbohydrate-rich food indigenous to the southern parts of India. It is prepared by steaming a fermented batter of rice and split black gram dhal. The fermentation process increases the bio-availability of proteins and enhances the B-vitamin content of the food. 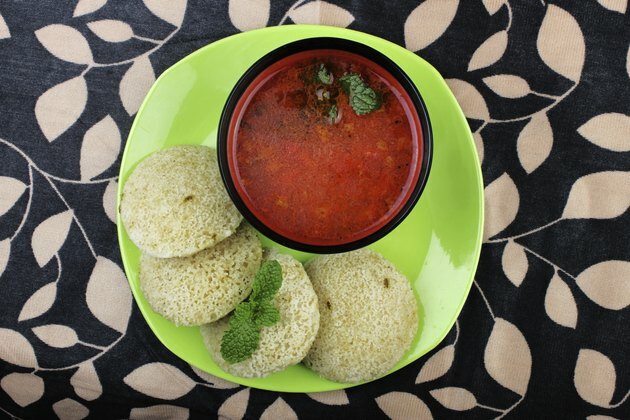 Idlis are a low-calorie, nutrient-enriched food with a balance of cereal and pulse protein. Since it is steamed, the fat content is lower as well. Place the grid at the bottom of the pressure cooker. Fill the cooker with 2 cups of water. Put the cooker on the stove and let the water heat. Grease the idli mold with oil. Carefully pour batter into each mold with a ladle covering 75 percent of the area. Leave little space for idli batter to rise. Place the mold filled with batter into the pressure cooker. Cover the cooker with its lid without adding the weight or whistle on the lid. Increase the heat to high temperature. Once the steam starts to rise from the vent, cook for 10 minutes. Switch off the heat. Let the cooker cool for five minutes. Remove the idli mold from the pressure cooker. Scoop off the idlis from the mold with the help of a butter knife and serve hot with coconut chutney. The grid is a pressure cooker accessory that usually comes with the cooker at the time of purchase. It is used for steaming foods in molds or other containers as it helps to minimize contact between food and the liquid at the base. If there is no grid, then skip filling the bottom section of the mold. The lower section will act as a separator between the other sections and the water at base. Never overfill the mold, as the batter may rise and spread all over. How Many Weight Watchers Points Are in Waffle House Grits?